We are living in exciting times for our understanding of the physical basis of our consciousness. In the last few decades the discoveries of cognitive neuroscience, molecular biochemistry, brain imaging, cognitive psychology and other scientific disciplines, are beginning to reveal the mechanisms behind consciousness. The implications of these discoveries for how we view ourselves is profound. It parallels, for consciousness, the paradigm shift that Galileo made for our view of our place in the cosmos in the early 17th century. The purpose of this page is to outline my exploration of this new physical understanding of consciousness. It will provide sources and documentation. People do not seem to be well informed on the recent discoveries in experimental neuroscience, which have been driven by new technologies developed in the last few years Diffusion tensor MRI imaging, allows us to see the tracks of neural fibres and the direction of the flow of water molecules within these. Functional MRI allows us to see which areas of the brain respond to external stimuli, by detecting the increased demand for blood to that area when the subject is presented with some image, sound or other sensation. Molecular biochemistry, developed over the last fifty years, is now throwing considerable light on the ways in which biochemical mechanisms drive and structure the activities of neurons, by the exchange of messenger chemicals and other factors that trigger the various receptors on the membrane of neurons to change the state of the cell. Cognitive psychology in its modern sense began in the 1960’s. In 1974, Baddeley and Hitch devised a model of working memory which they explored through laboratory experimentation. They realised that short-term or 'working' memory had a number of separate components the properties of which could be investigated in detail through experiments. The phonological loop is involved with sound or phonological information. 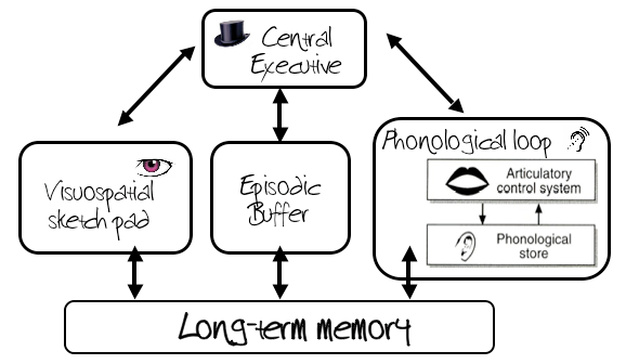 It has two subcomponents - a short-term phonological store that rapidly decays and an articulatory loop that can revive the memory traces by acting as the "inner voice" that repeats the series of words (or other speech elements) on a loop to prevent them from decaying. The visuo-spatial sketchpad is a short-term memory store, independent of the phonological loop, which holds visual information for manipulation, but only a total of seven items, plus or minus two items, can be stored here for a very short period of time, usually a matter of seconds. The episodic buffer links information across domains to form integrated units of visual, spatial, and verbal information in a time sequence or episodic ordering, such as the memory of a story or a movie scene. 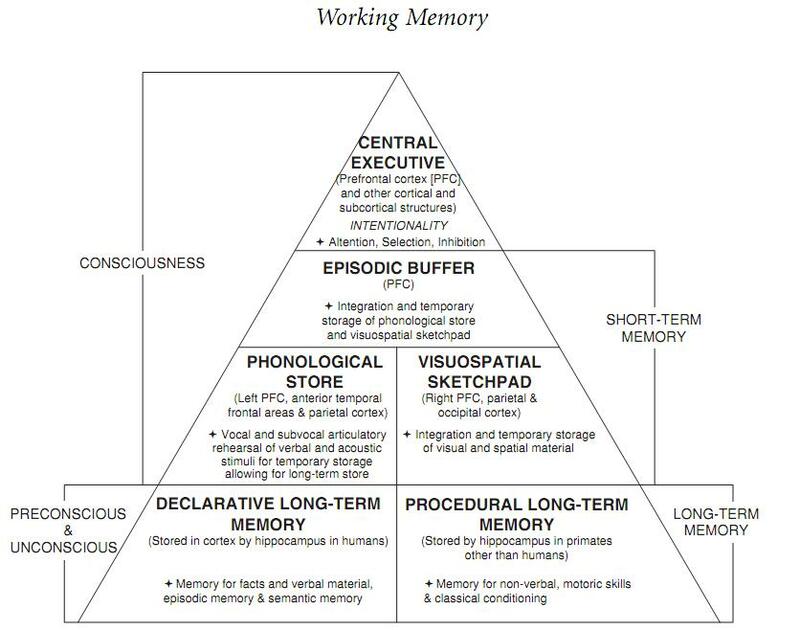 These components of our short-term memory are coordinated by the central executive, which directs, focusses and targets information, making short and long-term memory work together. It is a supervisory system over the visuo-spatial sketchpad (visual information) and the phonological loop (verbal information), either inhibiting their actions or giving them attention and focus. It is now thought that it is not centralised in a specific brain region but is more dispersed. Consciousness is obviously connected to short-term memory, as we experience the focus of our attention as a short time loop. In the last decade or so neuroscience has been able to explain the way memory recall is indexed through the structures in the hippocampus. Also the complex storing, updating and indexing of the way the cerebellum, our 'little brain', through which we unconsciously use our muscles when making fine movements, is now well understood. These two videos give a summary and overview of both of these aspects of our memory. There are thousands upon thousands of scientific papers exploring the detailed mechanisms through which these work. It is likely that these insights into aspects of our memory will throw light upon the mechanism of our consciousness. We are truly living in exciting times. An interesting interview with the philosopher Patricia Churchland reveals some of the ways in which contemporary neuroscience has impacted on our understanding of the brain and mind. Evidence based on various studies of the neocortex of the brain indicate that the neurons are arranged in vertical columns of about 100 cells. These have distinct layers, some of which have connections to the the thalamus, forming feedback loops. It is suggested that each column is the structure which holds pieces of information, perhaps even components of experiences or stored fragments of memories. These cortical columns have many interconnections, so that excitation of one column may make others actively spike. Thus a complex scenario, concept or memory may involve the working together of a number of columns. Here are two videos based on actual photographs which were created to visualise the structure and activity of cerebral columns. More on cerebral or neocortical columns. In recent decades there has been a move somewhat away from viewing the individual neuron as the primary unit in brain activity. In the neocortex, it is now generally accepted that the functional units are the vertical columns of around 100 neurons with more associated cells (glial and others). These columns hav various layers with inputs through axons in layer IV and outputs through axons in layer V. Layers II and III have links to other cortical columns. The inputs and outputs can be either excitatory or inhibitory. This arrangement of cells is not merely driven by action potentials (electrical signals) but its activity is structured by its internal chemical environment, particularly through neurotransmitters. GABA (gamma-aminobutyric acid) is an inhibitory neurotransmitter and operates by opening a channel that restores the resting potential of the neuron. GLU (glutamate) is excitatory and operates by opening ion channels. The biochemistry of these cortical columns is extremely complex with many other substances affecting the state of the system. We can see this, as the complex cells being in a stable state, until an incoming stimulus through an incoming axon. Some of these axons originate from neurons in the thalamus and other subcortical structures.